Caltha natans is a circumboreal species that is generally rare or local throughout its North American range. This is especially true south of the Canadian border, where it has been found at only a few sites in St. Louis County, Minnesota, and at only one location in Wisconsin. An additional cause for concern in Minnesota is the local extirpations recently suffered by this species. The reason for the extirpations is largely habitat loss, which is a well-documented problem for aquatic species statewide. Caltha natans is an aquatic species that was first collected in Minnesota near the town of Tower on Vermillion Lake in St. Louis County at the turn of the 20th century. It has been documented only sporadically since that time. Most populations discovered in the 1940s and 1950s have not been relocated. Despite the fact that there are many acres of apparently suitable habitat in northeastern Minnesota, only a handful of sites have been found since 1954. Several of these sites are at risk because of habitat alteration. 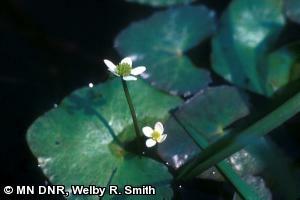 Caltha natans was listed as an endangered species in Minnesota in 1996. Caltha natans is a distinctive plant that bears only superficial resemblance to the more familiar C. palustris (common marsh marigold), which is larger and has yellow flowers. Caltha natans has small, white flowers about 1 cm (0.4 in.) across. Leaves are simple, thin, and subentire. The leaves and petioles commonly float in shallow water, but when water recedes the entire plant may be stranded in mud. Caltha natans occurs in shallow (often 6-7.6 dm (2-2.5 ft.)), slow-moving water in streams, creeks, pools, ditches, sheltered lake margins, swamps, and beaver ponds. It typically roots in mud, silt, or clay, and it spreads when stems root at the nodes. Some sites may support only a few scattered individuals but other sites may have a dense mat consisting of many plants. In Minnesota, C. natans is associated with Glyceria spp. (manna grass), Carex spp. (sedges), Potamogeton spp. (pondweed), and Utricularia spp. (bladderwort), with an overstory of Fraxinus nigra (black ash) or Salix spp. (willow). Unlike the other species of Caltha in North America, C. natans is relatively invariable morphologically and has not been divided into segregated taxa (Ford 1997). It is a perennial herb and is insect-pollinated. Caltha natans is very sensitive to habitat disturbances, especially alteration of naturally-occurring water level fluctuations, herbicides, nutrient enrichment, sedimentation, and non-native species invasion such as Lythrum salicaria (purple loosestrife). Clearing of vegetation in the riparian area of streams and on shorelines of lakes without an adequate buffer also presents a potential threat. Many of the habitats where C. natans is found are open to use by motorized vehicles and wake control is needed. Public water access and private ownership of lakeshore property combine to make conservation management more difficult (U.S. Forest Service 2000). Without collective stewardship by various dispersed interests, the cumulative impacts of land use and lake level changes could negatively impact C. natans. The best time to search for C. natans is from May into September, when flowers or leaves are present. The Minnesota Biological Survey is in progress in northern Minnesota and C. natans is a targeted species. Ford, B. A. 1997. Caltha. Pages 187-189 in Flora of North America Editorial Committee, editors. Flora of North America north of Mexico. Volume 3. Oxford University Press, New York, New York. Lakela, O. 1943. Rediscovery of Caltha natans in Minnesota. Rhodora 45:53-55. U.S. Forest Service. 2000. Population viability assessment in forest plan revision. Questions for plant population viability assessment panel: Caltha natans. United States Forest Service, Region 9, Duluth, Minnesota. Walton, G. B. 1994. Report for field season 1994 status survey for Caltha natans and Sparganium glomeratum in Minnesota. Final report submitted to the Natural Heritage and Nongame Research Program, Minnesota Department of Natural Resources. 9 pp.